Are you ready for one of the prime badminton events of 2016?? 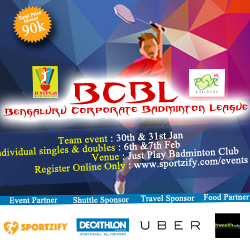 We bring to you a badminton league which covers all aspect of your game. Kick start your tournament with a team event and then complete it with the singles and doubles format in Feb first week. For team event entry fees is Rs 5000 but Rs 2500 should be paid on the spot. Dinner sponsered by Health Wealth Cafe and Free ride by UBER.